It’s Sunday. Just an ordinary day for most Americans. But for Korea it is the celebration of the Lunar New Year called Seollal. I can’t say that I really know that much about it. I know it is an important holiday for Koreans and that traditionally people travel to be with their families and prepare and eat traditional foods. I have heard that Seoul is a ghost town during Seollal since so many people depart to go be with their families. According to Wikipedia (en.wikipedia.org/wiki/Korean_New_Year), the Korean New Year is traditionally celebrated by eating Tteokguk , a soup with sliced rice cakes. It says the Korean New Year is similar to a birthday for Koreans, and eating tteokguk is part of the birthday celebration. Once you finish eating your tteokguk, you are one year older. But for me, mostly, it’s just another day. I went to Seoul yesterday for a meeting with my SGI Buddhist group. It was great! The chapter I participate in is a small group of mostly foreigners (remember, that’s me!) but also a few Korean folks too. We had a study group together yesterday and then a potluck to celebrate the New Year. I brought a fresh spinach dip to the celebration. Here is the recipe if you’re curious. I used soy sauce instead of the Worcestershire sauce and didn’t use any mayonnaise. Next time I think I’ll use greek yogurt instead of sour cream. At any rate, it was a hit and it was a nice gathering among friends new to me. After the meeting the leaders of the SGI group traveled with me back to Paju to “enshrine” my Gohonzon. For those of you not familiar with SGI Buddhism, the Gohonzon is a scroll with Sanscrit writing and is the object of devotion in the practice. I received my Gohonzon when I became a member of SGI two years ago, but as I have been traveling for most of the past two years, it is just now that I am a little more “settled” and I am able have and use and practice with my Gohonzon again. It was fun for me to lead them from Seoul to my new “home” in Paju. They had no idea what to expect from English Village. They were tickled and delighted to discover English Village is like a small theme park, complete with a giant mock Stonehenge at the entrance! “So you live in there?” they asked referring to behind the gates entering English Village. “Yep” I said. Not your typical Korean abode! They were like kids in a candy store as we entered through the gates and I began to lead them through the campus to my room. They were generous in their description of my little “home” in English Village. “It’s cute” they said. “So cozy” and “It’s like a little hotel room.” All little affirmations that were nice to hear and in fact, for me it is cozy! We spent a little time together in my room, hung my Gohonzon in its new cabinet and did a little chanting together. It was really sweet for me to have them all there and to spend that time together. 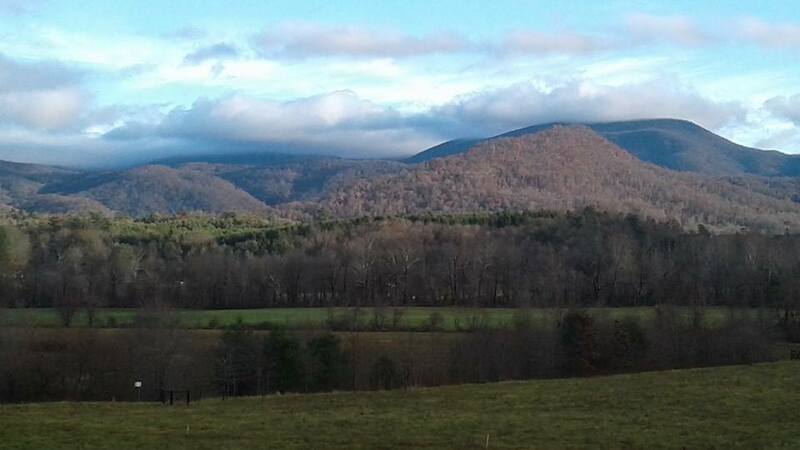 As it is the New Years holiday, we have fives days vacation this week at English Village. This is time that many staff use to travel to near-by (and not so near-by) destinations – Thailand, Japan. As I am a recent arrival I was not yet prepared to take a trip but look forward to having a nice low-key week and doing a little sightseeing in Seoul. I am not alone in my New Years respite at English Village. We have a staff potluck/New Years celebration tomorrow night and it will be fun to share food and time together in the midst of the slow-paced holiday break. And today, the day of Korea’s New Years celebration, I find I have time to rest, relax and have time with myself. I have indulged in a little on-line video streaming, plucked around on the internet, as well as my typical respite of Reiki and yoga. A fresh thick coat of snow last week. 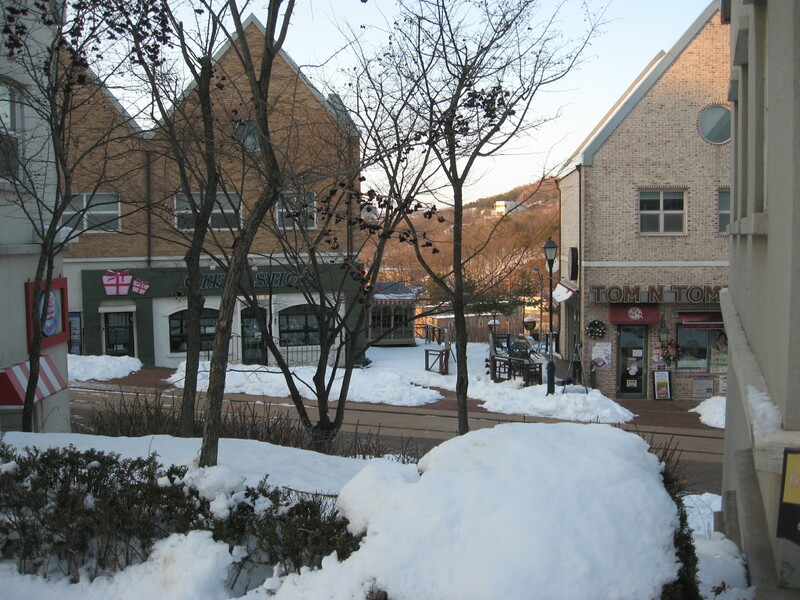 It wasn’t a blizzard or anything – just regular winter life in Paju South Korea. I was told not too long ago by a young Korean man I met on the subway (who was excited to see a “foreigner” so he could practice his English) that according to Korean tradition, I am 44 years old. Now I don’t know exactly how that works… but somehow in that process I gained two years! (I am 42 in American years) And so it is. The sun is starting to set and the quiet evening is making itself known. It is so peaceful here right now that the only sound I can here is the hum of my heater blowing overhead. We remain cold here with a hearty blanket of snow on the ground unwilling yet to go away. And so, this is the context and the landscape of my Korean New Year. My only question is… with this New Year, am I now 45? Top Photo: Toto, we’re not in Korea anymore! Stonehenge? The unexpected welcome at the entrance to Gyeonggi English Village in Paju City, South Korea. Life starts at conception so you are always a year older. I’m not sure how exactly it works but if you are born on a specific month you get an additional year. Anyways, I enjoyed your post. Did you convert to Buddhism? I’d love to hear more of your stories, granted this is the first post I’ve read. Hi Brent, thanks for writing! As for your question “Did I convert to Buddhism?” For me I don’t feel like I converted to Buddhism. It feels more to me like a new spiritual practice in my life, perhaps similar to yoga or Reiki. I am still fairly new to it and exploring how the practice and philosophy folds in with other already held ideas, experiences and beliefs. Thanks for asking! I read more about that after I commented to I got a better sense of your spiritual journey. Pretty interesting stuff? Is it Jogye or Seon Buddhism that you are studying? Hi Brent, it sounds like you know something about Buddhism! I practice with an international buddhist organization called Soka Gakkai International. It is based on the teachings of a Japanese monk named Nichiren Daishonin from the 13th century. He came after the one we know as the Buddha, Sidhartha or Shakyamuni. Nichiren, after much study determined the Lotus Sutra to be the the most important teachings of the Buddha and that is what Nichiren buddhism focuses on. In truth I am still pretty new to it and growing in my understanding. But a friend of mine turned me on to it and I have found great comfort and benefit from the chanting which is the foundation of the practice. So far for me the practice has been the foundation of my experience (chanting) and the understanding of its history and teaching is coming with time. What about you? Do you have a spiritual practice?